Yes, there are so many things that I would like to talk about Kakao Talk (Ka-Talk). And plus, the relationship between Kakao Talk and Ajumma is much more interesting to talk about. Through survey and focus group interview, I realised that Kakao Talk became one of the key mobile communication apps among ajummas in Korea. More than 95% of ajumma participants responded that they’re using Kakao Talk the most among various other apps on their smartphones. They were allowed to choose multiple answers for the question of ‘Which applications do you use the most’ in the survey. Anyway Kakao Talk ranked the top application among ajumma participants for my research. They use the Kakao Talk mostly due to its convenience and instantaneity. They usually use the group chat room where many people can talk together in the same place at the same time. I can’t say all of ajummas in Korea are now using Kakao Talk as their primary communicative application, but I can say that some of ajummas bought smartphones to use Kakao Talk. My mom also did. 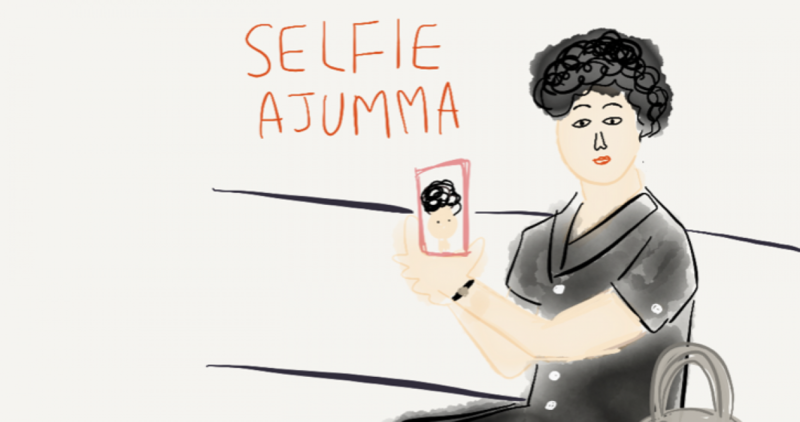 So, ajummas are having communication in both offline (e.g. cafe, restaurant, etc.) and online (e.g. Kakao Talk’s group chat room, blog, etc.). This means that their spaces for communication are extended from offline to online (mobile). And at the same time, they do have more opportunity to meet their contacts (friends or family) through various spaces (offline/online) without having barriers of time and space today. In other words, Kakao Talk’s group chat room allows ajummas to keep having their offline meetings continuously even though they cannot meet with each other face-t0-face. Also the communication in Kakao Talk’s group chat room leads ajummas to plan to have following offline meetings. So Kakao Talk’s group chat room is like a bridge which links between offline meetings and online meetings and pre-meetings and post-meetings. Posted on 16 Feb 2016 16 Feb 2016 by moon ajummaPosted in Smart Ajumma (English)Tagged ajumma, 대한민국 아줌마, 아줌마, 한국, 한국아줌마, 카톡, 카카오톡, Ka-Talk, Kakao Talk, Korean, Korean women, Seoul.